Create this cute little 40mm chenille teddy bear with just one 500mm pipe cleaner, three tiny beads or a black pearl maker pen and a small bow. Teddy's easy and quick to make and is ideal as a sweet topper for a new baby card, a brooch, keyring and a friendly embellishment for many craft projects. Cut one 50cm pipe cleaner into 6, 9 and 11cm lengths. Keep the remaining piece, this is required later. Fold the ears, arms and leg pieces into the centres. Allow the ends to overlap slightly. Wind the 24cm piece around the ears twice. Then wind it twice again, this time winding from the top right to centre bottom once and then the top left to the centre bottom. This gives shape to the head. Place the arms under the chin and the legs below the arms. Wind the pipe cleaner from one shoulder to between the legs. Then from the other shoulder to between the legs. Keep winding like this until you reach the end. Tuck the end in to finish. Glue three small beads into position for the eyes and nose. Alternatively use a black pearl maker pen. Attach a bow to complete. Attach teddy to a key chain or pencil case zipper. 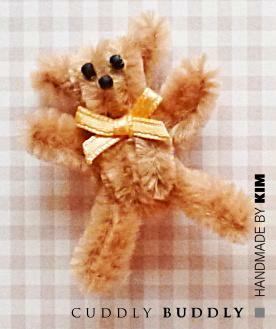 Attach a brooch back or magnet to teddy. Attach a teddy to new baby cards. Glue teddy onto a pencil.